Birthday season is rapidly approaching at our house. 5 of the 8 of us have birthday's within a couple weeks of each other. 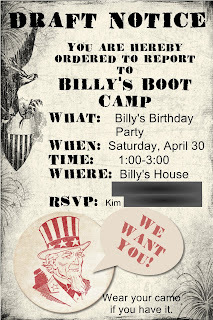 When Cheyenne was just little, Bill and I decided not to do a big birthday party for the kid's every year - what can I say, we're cheap. 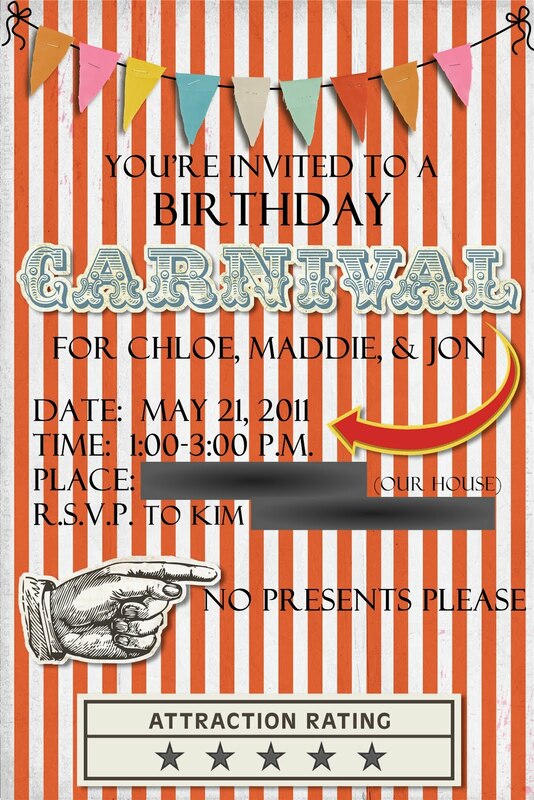 :) So we do a party when they turn 6 - now in school and they finally have friends to invite, and when they turn 8, 12, and 16 - those are all big years to us. So lucky for us, no parties to plan this year. 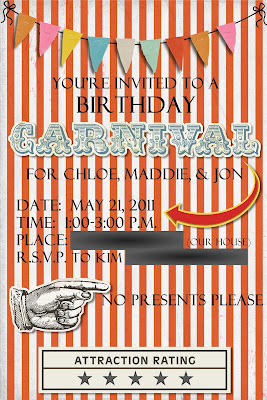 While I do enjoy all the party planning and the idea of having a party, I tend to stress out a little the day of the party - it's all too crazy and chaotic. lol So I'll share a recap of parties we've done in the past and those my awesome sister, Leslie, who is the party queen, has shared with us. Click on the links to see more of each party. 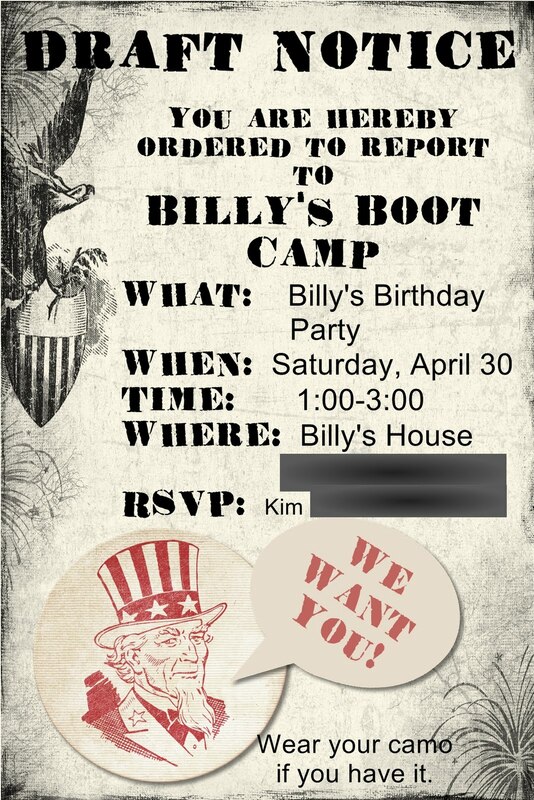 For Billy's 8th birthday we had so much fun with an Army Party. I think this was the only time Bill actually got involved much - and I think he had as much fun as the boys. I still, a year later, have one of the boys who every time he sees me says, "That was the funnest party ever!" As they arrived, I gave them all dog tags I'd made them and let them fold/decorate/fly their own paper airplanes, while waiting for everyone to get here. Then we moved on to a little calisthenics "Simon Says". We set up a nerf gun shooting range upstairs in our bonus room, which was a huge hit! They even shot at a few stuffed animals with target vests on them. The last activity was a scavenger hunt "rescue mission" to find bags of army men for each of them. They each built one and then we raced them over and over again. They also took the cars home as their favor (along with some candy.) The boys had a blast! 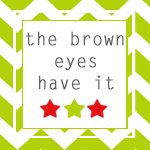 This was back before I blogged at all, actually before I'd even heard of blogs, but it was really fun so I'll share it now. For Natalie's 7th birthday she wanted a cooking party. We had the girls bring an apron, or we had a few for those that didn't. While they arrived they decorated bands that we made into chef hats (stapled tissue paper inside.) Then they made their own pizzas. We gave them the dough and let them roll it out, and top it with whatever kinds of toppings they wanted. While the pizzas cooked, the girls went outside and played. Then they ate the pizza for lunch, opened presents, and that was about it. A little more prep work making the dough and stuff, but probably the easiest party I've done. Go click on the link. Leslie gives great details of her super fun party. Every time my kids see these pictures they say with a big sigh, "I wish we could live by Aunt Leslie and go to their parties." My favorite part is the larger than life Angry Birds game. And aren't these the coolest?! My boys would LOVE these for their backpacks. Leslie made one of these for each of the kids. Leslie floors me with her artistic ability. I have trouble with stick people. 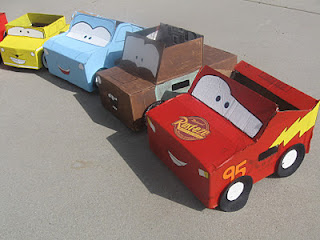 Check out the cars she made out of cardboard boxes. The kids got to race IN the boxes! This was such a fun idea. She even let the kids have a wild rumpus﻿! However, the best part is her decorations. They are amazing!!! Are those pictures the cutest things or what?! Go check out the cupcakes she made, too. Well, I hope that gives you some ideas for your next birthday party and makes planning that perfect party just a little easier. Leslie is also entering her month of birthdays as well (all three of her boys have birthdays within weeks of each other), so hopefully she'll be back soon with more great birthday ideas. Thanks for sharing these lovely party ideas in your blog and all the ideas are useful to create more fun for kids. 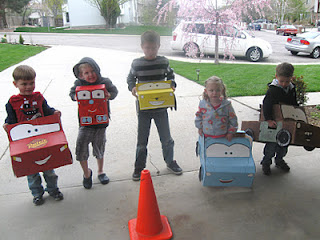 Oh my goodness - those cardboard car cutouts are amazing! Thanks for sharing all these neat ideas! So glad you linked to Things I've Done Thursday! I'm hopping over here from Delicately Constructed Friday. I love the Angry Birds, and the car idea is really cute! However, we did just finish a great Fire Truck party today that I will be posting about soon! Thanks for sharing all the party ideas. We have a big 8 year old party coming this year. So I need the ideas. :) Thanks for sharing with us at Link It Up Thursday. You Celebrate the birthday in a unique way...you did it right.